Not sure if this is in the right place so feel free to move. I saw a segment on one of the news shows about a trial that is looking at the validity of public screening for lung canceer in the same way breast and other cancers are offered. After a bit of investigation I found the full information and the link below is the call for registrations. As a former chronic smoker (50+ a day) my biggest fear as I age, is Lung Cancer. Both parents died of lung disease, so while I still qualify I am going to try and register to join the trial. Aside from being something I am interessted in and have some history with, I would like to be monitored for any early detection methods I can. I also secretely hope that if I participate and anything untoward is found I will know the people to talk to for any new treatment methods. Many of the folks here would fall into the eligible catagory and it might assist the study to have vapers included. I do not know whether vaping will exclude participation but as soon as I know I will post any updates. This is the link to the request for trial participants. I left a message and I am awaiting return phone calls. Last edited by Crisscross; 25-06-17 at 07:33 PM. gert, margyb, gtadmin and 7 others like this. I saw a segment on one of the news shows about a trial that is looking at the validity of public screening for lung canceer in the same way breast and other cancers are offerred. After a bit of investigation I found the full information and the link below is the call for registrations. As a former chronic smoker (50 a day) my biggest fear as I age is Lung Cancer. Both parents died of lung disease, so while I still qualify I am going to try and register to join the trial. Aside from being something I am interessted in and have some history with I would like to be monitored for any early detection methods I can. I also secretely hope that if I participate and anything untoward is found I will know the people to talk to for any new treatment methods. 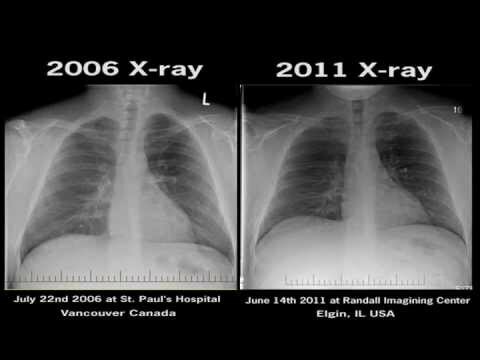 I also have previous before and after lung x-rays and lung function tests for comparison (1 year after quit date) The x-rays were inconclusive but the lung function test results were a marked improvement. No up to the level of a never smoked but a long way from a smokers and my initial ones. shaneo, stylemessiah and AllyP like this. I know it's not a scientific test. Also too it seems to come from a shop. But it is good to see. https://www.youtube.com/watch?v=DMYLTcNNQEI xrays start at 1;18 mins.